The Beard: Houston Rockets star James Harden. THE BOSTON CELTICS topped the Indiana Pacers 84-74 in game one of their NBA Eastern Conference first-round playoff series, while the Houston Rockets defeated the Utah Jazz in the west. A surprising 20-point performance from Markieff Morris assisted Kyrie Irving’s 20-point effort in Boston’s opener on Sunday. The Portland Trail Blazers took a 1-0 lead in their Western Conference match-up with the Oklahoma City Thunder after winning 104-99. Damian Lillard led all scorers with 30 points, but CJ McCollum and Enes Kanter also had big games for the Trail Blazers. Thunder star Russell Westbrook posted 24 points, 10 rebounds and 10 assists, but Oklahoma City could not overcome terrible three-point shooting, as they made just five of 33 attempts. Eastern Conference top seeds the Milwaukee Bucks saw off the Blake Griffin-less Detroit Pistons 121-86 in game one. The Bucks moved ahead early and stayed there behind a well-rounded scoring attack thanks to Giannis Antetokounmpo’s 24 points and 17 rebounds. Griffin was absent for the Pistons due to a knee injury and will likely have to a huge impact to turn the series around when he makes his debut. Meanwhile, James Harden’s 29 points and 10 assists led Houston to a convincing 122-90 victory against Utah. Everyone will be watching to see if the Philadelphia 76ers can bounce back from a game-one upset. The Brooklyn Nets have little playoff experience, but put on an inspiring performance to take down the third-seeded 76ers on Saturday. This game will be critical for Philadelphia, as they could have to head to Brooklyn down 2-0 if they cannot respond. Email “Celtics start strong, Harden leads Rockets past Jazz”. 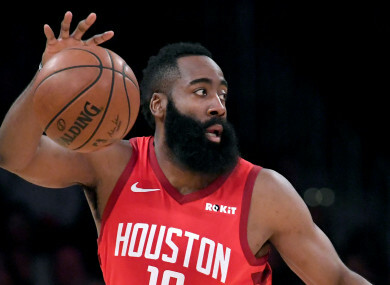 Feedback on “Celtics start strong, Harden leads Rockets past Jazz”.